For generations the old lighthouse had guided sailors home from the sea . . But will its magic work one more time and guide a lonely man and woman home to love? From the moment they met as children, there was something special between Noah Chase and Gracie Taylor, something that grew and matured right along with them. Despite Gracie's troubled family - and Noah's cold, distant one - they managed to make each other laugh and keep each other's dreams alive. . . But Noah's father already had plans for his golden boy's future - plans that did not include the likes of poor, ordinary Gracie Taylor. And when he succeeded in tearing them apart - on the night before their wedding - it seemed those childhood dreams and teenage passions had been crushed by more grown-up things, like sorrows and secrets and lies . . .
Now Gracie has returned to Idle Point, Maine - and so has Noah. Over the years they've wondered if those dreams were just delusions, or if a love like theirs could ever happen again. Maybe they'll find out at last . .
"AT LAST is an exciting romantic drama that highlights the destructive side of obsessive love on innocent future generations . 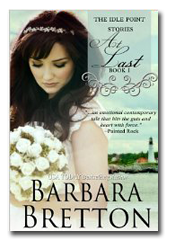 . . Barbara Bretton provides her fans with an emotional contemporary tale that hits the guts and heart with its force." 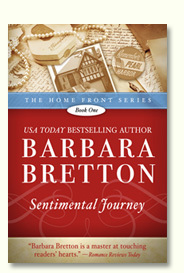 "Ms. Bretton takes you on an emotional roller coaster as she guides you through the lives and loves of Idle Point's residents. I was so impressed with her character Gracie that I wondered if I could measure up to her if posed with the same challenges." Bretton's beautifully crafted tale offers a variation on the plot of Romeo and Juliet that transforms the tragedy into a romance. 4 1/2 stars - RT Top Pick for November Ms. Bretton takes the star-crossed lovers plot and turns it into her own convincing and distinctive storyline. 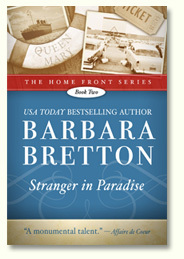 Ms. Bretton's writing style is wonderfully suited for complex human emotions. --Jill M. Smith, "Romantic Times"
" . . . a richly textured book . . . I could hardly ask for more." --Mary Sophia Novak, "All About Romance"
4 stars - a recommended read. --Susan Scribner, "The Romance Reader"
The last person to actually see Graciela Taylor on the day she left Idle Point, Maine forever was old Eb at the Stop & Pump. Maybe if sheíd planned her getaway a little better -- or had any idea at all that she was going to leave her fiance standing at the altar -- she would have seen to it that her gas tank was full. As it happened, the needle on her fuel gauge hovered over the E and she was forced to make a right into Stop & Pump and pray Old Eb wasn't in a talkative mood. She might have taken her chances that she'd make it to Portland before the engine sputtered then shut down, but that was too risky. The last thing she wanted was to run out of gas on Main Street and bump into Noah on his way home from the wedding that wasn't. Old Eb peered out from his office, then did a double-take which didn't bode well for her speedy getaway. He'd been around since long before Gracie was born and heíd seen everything there was worth seeing around Idle Point and a few things he'd rather forget. He was the one who'd found Gracie's mother dead at the bottom of the ravine, trapped in that old Chevy with the horn blaring. He was the one who'd found Gracie, thrown clear from the wreck and crying to beat the band. He was the one who wrapped her in blankets and held her close while they waited for her father to identify his wife's body. She and Eb had a history. If he had any idea what she was up to, it would be all over. "You forgetting where you're supposed to be?" he asked as he ambled over to where she stood next to the old Mustang she'd bought four years ago with the money she'd saved working in the kennels for Doctor Jim. "They're down at the cove waitin' for you, Gracie. I'd be there myself if I didn't have to earn a living." She smiled, wishing she'd taken time to exchange her short lacy white dress for the pair of jeans and a sweater. She looked like exactly what she was: a runaway bride. "I'm on my way," she said, carefully not specifying her destination. She was too fond of Eb to lie to him. Eb checked his pocket watch. "Thought the clambake began at two o'clock," he said. There was a sharp note of curiosity in his voice as his faded blue eyes took in her outfit. "It's near to half-past. You can't be late for your own goodbye party." Eb knew that she was due to leave for Philadelphia the next morning to begin her first year of veterinary school at the University, the goal she'd been striving for since she was barely old enough to walk. "I know," she said, "but I'm running on fumes and . . . " She shrugged. "You know how it is. There was so much to do." He was a native New Englander, same as she. Didn't he know New Englanders were famous for minding their own business? Eb checked her oil and cleaned her windshield while the tank guzzled down the gallons. If he wondered why Sam the Cat was grooming herself on the passenger's seat, he never said. Gracie peered nervously over her shoulder every time she heard a car approach. A clean getaway, that was all she wanted. When the dust cleared and the hurt feelings mended, maybe then they could talk. She'd left a note for Noah on the kitchen table. She told him that she was sorry, that she hadn't planned on any of this, but wasn't it better to put an end to it now before it was too late? Besides, how did you explain to the boy you'd loved since kindergarten that leaving him was the best thing you could ever do for him. Eb screwed the gas cap back on good and tight. "What do I owe you?" she asked as she reached for her purse through the open car window. Eb plunged his gnarled hands deep into the pockets of his overalls. "Just get yourself a good education, girlie, then come back home to us where you belong. I've waited a long time to dance at your wedding. I want to see you all set up with a job and a husband and a few babies." He didn't have any idea what he was saying. You don't understand, Eb. There was supposed to be a wedding today but I backed out. We were going to throw aside all of our plans and run away to Paris together. Can you imagine, Eb? I love him and he loves me but we don't have a chance in the world of being happy together. His father has seen to that. That's why I'm going to get behind the wheel of my car and get away from here before I start believing in fairy tales. Noah had been part of her life for as long as she could remember and he had owned her heart almost as long. Even during those years when he was away at boarding school, he was never far from her mind. Not that he'd known she existed until he came back to Idle Point after his father's first heart attack and everything fell into place. Loving him seemed as right and natural as breathing; marrying him was simply the next step. Noah and Gracie had been together since senior year of high school and they had stayed together despite the best efforts of their families to break them up. You wouldn't think their fathers' paths would have crossed very often, not even in a small town like Idle Point, but the hatred between the two men was legendary and the poison spilled over onto their children. They had learned through experience to keep their love hidden away from their families. When they went off to college -- Noah to B.U., Gracie to the University of Pennsylvania -- everyone was sure distance would put an end to their teenage love affair. Nobody but Noah and Gracie knew of the weekends spent sharing pretzels on the steps of the museum in Philadelphia or strolling near Independence Hall, talking about the home they would build together, the family they would raise. Gracie would join Doctor Jim's veterinary practice while Noah wrote the Great American Novel. She'd heard the whispers from some of her so-called friends, the ones who wondered how a plain girl like Gracie who lived over by the docks had managed to land someone like Noah. Gracie was serious and ambitious and poor. Noah was a rich man's son who thought life was his for the taking. He'd flunked out of B.U. and if he had some game plan for his life, he wasn't sharing it. He wasn't serious about anything, didn't Gracie know that? One day he'd call her up and say, "You know there'll never be anyone else like you, Gracie, but I've met someone else and . . . "
Everyone but Gracie knew that was going to happen one day. Why couldn't she get it through her head that she was fooling herself? Their poison-tipped words hurt but a long time ago Gramma Del had taught herself how to deflect the sting and hold her head high. They never knew how good their aim was. Noah loved her for who she was inside, not for how she looked, not for what she owned. He didn't care that she was tall and skinny and blessed with brains, not beauty; with a heart, but not a bank account. They loved each other and up until last night she had believed that was all they needed. Whoever thought it would be Gracie who broke Noah's heart? She had Simon Chase to thank for ruining their lives. He'd shown up at her father's house an hour ago. Sixty minutes was all it took to shatter her dreams. Her future father-in-law was an imposing man, tall and white-haired and blessed with the natural arrogance of the born Yankee aristocrat. His bad heart had slowed him down but the fierceness of his gaze when he looked at Gracie hadn't softened a bit. She had always suspected that Simon didn't like her but she'd never imagined the depth of it until that afternoon. Simon had connections up and down the coast of Maine and right across into lake country. Noah and Gracie had slipped down to Portland last week to apply for their wedding license, figuring nobody in the city office would pay any attention to them. They were wrong. A clerk recognized the Chase name and mentioned it to his superior who happened to mention it over lunch to a friend and an hour later Simon's office phone was ringing with the news. "You'll do the right thing," Simon had said as he rose to leave. "If you love my son the way you say you do, I know you'll do what's best for him. There's really no other way, is there, Graciela?" It wasn't until Simon and his late model Lincoln disappeared down the road that she found the envelope propped up on the kitchen table between the sugar bowl and the salt and pepper shakers. Ten thousand dollars to leave his son alone. Ten thousand dollars to keep her from ruining Noah's life. Apparently that was the going rate for betrayal in Idle Point. "I mean it, girlie," Eb was saying. "Save your gas money for when you're filling your tank in New Jersey. Nobody gives anything away in New Jersey." "I can't let you do that," she said. "You already gave me that beautiful silver mirror that belonged to Sarah when I started college." His eyes glistened with tears. "Sarah loved you like one of her own grandbabies. You know she always prayed you and Noah would end up together one day." Oh God. Can this get any worse? Let me get out of here before what's left of my heart breaks in two. She knew when she'd been bested and kissed Eb on a weathered cheek. "Thank you," she said. "You're very dear to me." Eb turned red beneath his grey whiskers. "You make us proud, Gracie. Understand?" "I'm doing the right thing," she said as she climbed behind the wheel. "This is the best thing for both of us." Simon Chase had proved that beyond a doubt less than an hour ago. "What did you say?" Eb asked but she only smiled at him. She'd said too much as it was. 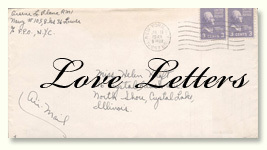 She gunned the engine and reached into the glove box and withdrew an envelope thick with bills. "Here," she said, handing it to Eb through the open window. "Now you can take yourself that vacation you and Sarah always talked about." Her wheels spun on the gravel as she roared out of the gas station. "Hold your horses!" Eb's voice floated after her. "There's money in this envelope! What do you --"
The last thing Gracie saw in her rear-view mirror was old Eb standing in the middle of the road with Simon Chase's blood money dangling from his fingers like a flag of surrender. She didn't slow down again until she reached Boston.